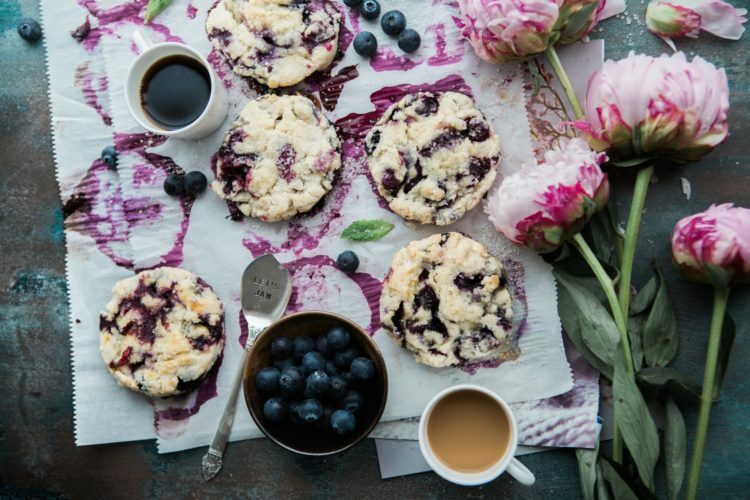 These delicious scones are made with almond flour, which can help to balance out hormone production, as well as fibre-rich coconut flour, both of which also give it great taste. Served with lashings of cashew cream and some fruity chia jam, they make for the perfect afternoon tea snack – perfectly guilt-free! 1. Put the blueberries into a saucepan (add 1 tbsp of water if using fresh). Gently heat, stirring often, until the skins break down and they form a purée. Remove from the heat. Put into a blender with the dates and vanilla paste and blitz to your desired consistency. 2. Stir in the lemon juice and chia seeds, then allow to cool – the mixture will thicken over time and will be ready for spreading over a couple of hours. 3. Pour into an airtight glass jar and store in the fridge for up to 1 week. You can also freeze the jam in ice-cube trays – perfect for popping straight into smoothies. 1. Add all the ingredients into a blender and blitz until smooth. Scrape down the sides of the blender when needed. Add a splash more water or coconut milk, if needed, until you reach the desired consistency. 1. Preheat the oven to 170◦/325◦F/gas mark 3. Line a baking tray with greaseproof paper. 2. Stir together all the dry ingredients in a large mixing bowl. In a separate bowl, beat the egg with the maple syrup/raw honey, vanilla, and 1 tbsp of almond milk until smooth. \3. Stir the wet ingredients into the dry ingredients until just combined, adding a splash more milk or water if the mixture feels too dry, then stir in the dried apricots (if using). 3. Shape the dough into 4 scones. Brush over the additional tbsp of almond milk and bake for 20-30 minutes, or until golden. 4. Serve the scones with dollops of cream and jam and a good mug of herbal tea. Maya nuts are our newest fascination for their nutrient-rich profile and history as a staple in prehispanic cultures. Because of their high fibre content, Maya nuts can also help to improve digestion and keep you feeling fuller for longer. Unlike other nuts like peanuts or walnuts, they don’t result in allergic reactions, making them and their powder safe for all to consume. Click here to find out more about this South American supernut – and how you can incorporate it into your own diet.